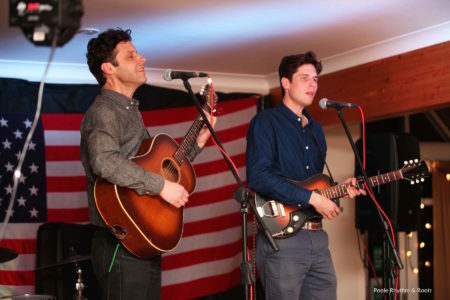 A chilly night in a school hall just off the main drag between Bournemouth and Poole – probably not the stuff of dreams for the first night of their first European tour, but if The Cactus Blossoms are as warmly received every night they’ll be itching to come back. With a refreshing lack of artifice and image projection Minneapolis brothers Jack Torrey and Page Burkum take an authentic and unashamedly old-fashioned view of their stock in trade, namely simple songs sung well about a cast of characters you’d sure like to meet. It’s the harmonies that get you first – pure, unforced and so closely connected they can only be genetic. The spirit of the Everly Brothers is inescapable and the boys don’t hide from it. Quite the opposite and given the influence that Phil and Don exerted on the British beat boom Jack and Page are more than entitled to co-opt covers of obscure Kinks’ b-side Who’ll Be the Next in Line and the much better known Beatles’ b-side This Boy into a sparkling set that’s delivered, like those harmonies, in two parts. The Cactus Blossoms’ debut album could have been exhumed from 1959 and yet it still sounds right today. Spooky. Aptly enough it’s called You’re Dreaming and they open with the title track, a beautifully paced slow burner about romantic insecurity that comes laced with lyrics soused in self-inflicted pain. There’s a distinctly otherworldly quality about they way they sing and play – Page’s acoustic guitar filling out the bright dancehall fills of Jack’s tiny solid bodied electric, backed sympathetically by a seamless rhythm section, but those harmonies, always those harmonies… somehow almost creating visuals in the mind’s eye. Don’t be surprised if these boys turn up on the soundtrack to a Coen brothers’ opus, or a David Lynch. We’re treated to the entire record, although have to wait for the second encore to hear its best-known moment, Stoplight Kisses, as charming a slice of pre-Beatles candy pop as any you’ll hear, but with a hint of something not quite right that’s also heard on album standouts Change Your Ways Or Die and Powder Blue. Both employ simple hooks that gently flood the memory and don’t let go as they fold around lyrics that warn as they warm. The inclusion of Chuck Berry’s Brown Eyed Handsome Man owes much to the Buddy Holly version and they introduce Crazy Arms, best known as a Patsy Cline hit, as having been learned from Ray Price. These, together with long lost Sun rockabilly nugget No More Crying the Blues and Hank Williams’ classics Tennessee Border and I’m So Lonesome I Could Cry, further reveal the roots of The Cactus Blossoms, but it won’t be long before the dues-paying is a thing of the past as there’s more than enough depth in their originals to carry them forward. A word also about support act Junco Shakers – raw, raucous and from Southampton, they aspire to ‘sing like Bing’ and come close with their take on St Louis Blues. There’s a riveting version of Ain’t Misbehavin’ before they absolutely nail the punky, peppy end of Lonnie Donegan’s skiffle with a scintillating take on Gamblin’ Man. Watch out for this lot further on down the line.